Are you there, Mom? It's me, Margaret. 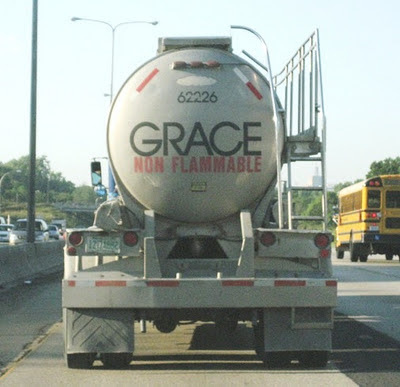 Sorry, I was hoping to catch you. Anyway, I just wanted you to know that I made a donation in your name to Planned Parenthood. I couldn't think of a better way to celebrate the life you gave me than by supporting the slaughter of unborn children. Happy Mother's Day, Mom! Bye! I have a minister that likes to say: "Are you surprised?" 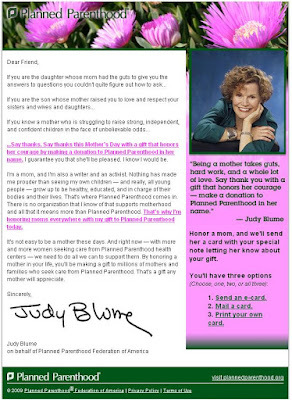 Are you surprised at Judy Blume suggesting that a way to honor mothers is to donate to a corporation that is involved in the wholesale abortion of babies? Are you surprised by her statement: "Nothing has made me prouder than seeing my own children - and really all young people - grow up to be healthy, educated, and in charge of their bodies and their lives?" Given the state of fallen man I am not totally surprised, but I am saddened. On a side note who was in charge of the mother's body/life when she chose to put herself at risk to get pregnant?